Last night's West, Texas fertilizer explosion created a massive fireball (as shown in videos) that we knew caused massive damage. 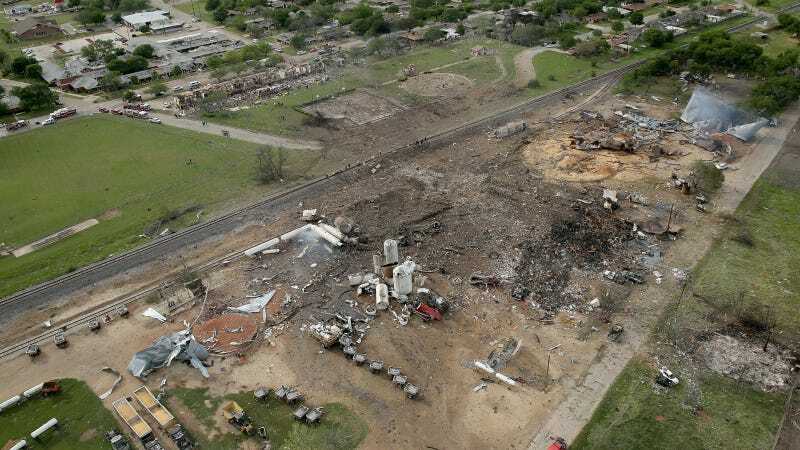 This aerial photo, annotated with some before shots and video, shows just how expansive the damage was. Last night a facility that stored fertilizer in the small town of West, Texas caught on fire and exploded. Local news reports that eight-to-ten bodies have been found and, sadly, they expect at least half a dozen more. Many of those deceased were first responders. There isn't much left of the fertilizer storage facility, located on the northeast side of town, and there's significant structural damage to a nearby nursing home and apartment complex, as well as a small playground. Using this Getty Images photograph and an aerial photo from Bing Maps I've been able to add some images of what it was like before from a slightly different angle.